It is situated about 14 kms away from Agartala at old Agartala. 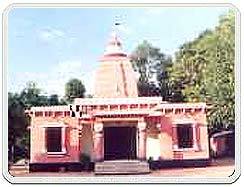 The Chaturdasha Devata Temple of old Agartala goes back not to a very distant past, but from the historical point of view, it has a special importance. Udaipur fell before Samser Gaji, compelling Maharaja Krishna Manikya to shift his capital from Udaipur to Old Agartala. The royal palace of Old Agartala, now in ruins, still attracts visitors. The temple of Chaturdasha Devata was built for the fourteen head images of Gods and Goddesses called 'Chaturadasha Devta' by the King Krishna Manikya and these head images are ceremoniously worshipped during the 'Kharchi Puja'. The images present in the temple represent only the heads of the gods and goddesses worshiped. It is only during Karachi Puja that all the fourteen gods are brought in the open for devotion in public. Thousands of pilgrims and devotees from tribal and non-tribal communities visit this place during festival. The temple consists of a Nat Mandapa and Garbhagriha. The roof of the temple is flat, on which rise two tapering domes, the upper one stepped slightly behind the lower one. The top of the dome is crowned with Kalasa (pitcher) including Pataka (flag).